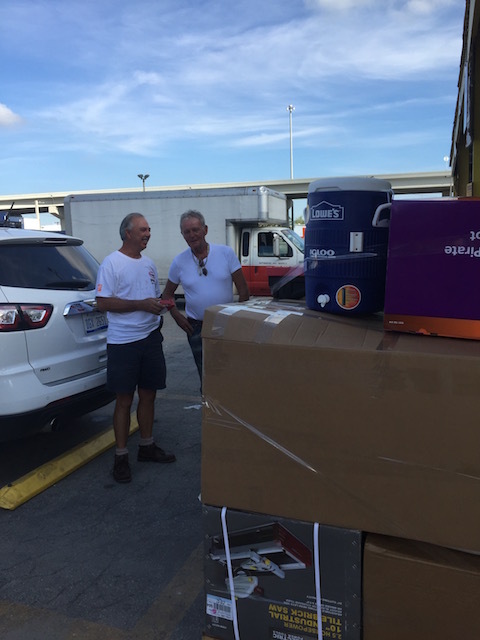 Although living here in Eleuthera is really wonderful, sometimes you need to find the time for a short break and so last weekend we took off for a few days to Florida….. there were chores to be done of course – all the usual – Home Depot, Lowes, Harbor Freight Tools and of course Ikea as well. Plus a very important visit to Petsmart to stock up on all sorts of necessary items – no really – for dear Rudge. 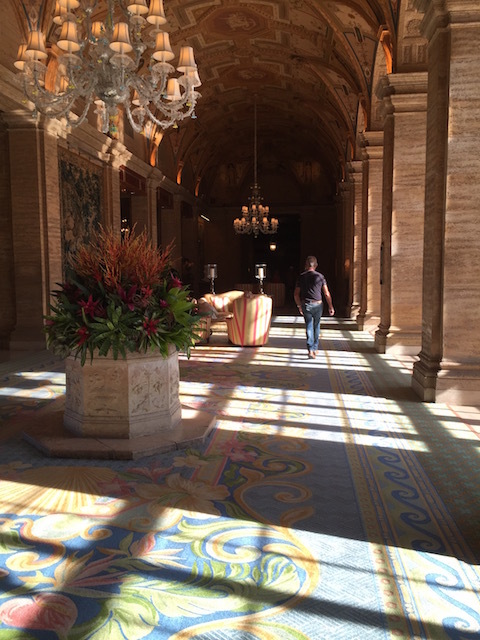 But this time we spend a couple of nights at The Breakers in Palm Beach – somewhere completely new for us. 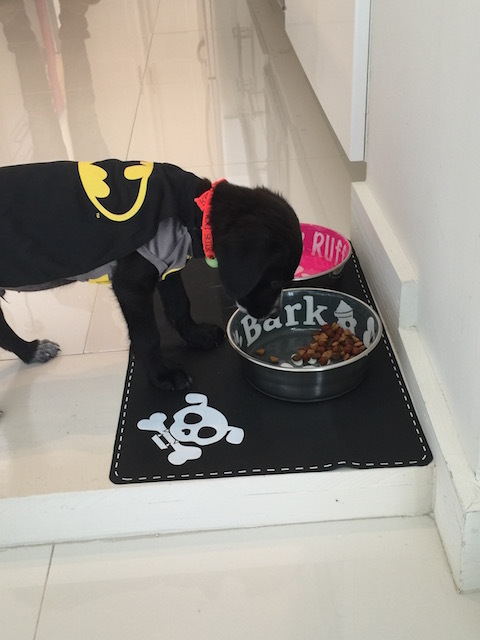 Judge showing off his new food bowls, mat and hmmm yes – a BATMAN outfit ? How could you do it to him Bob Colman ??? 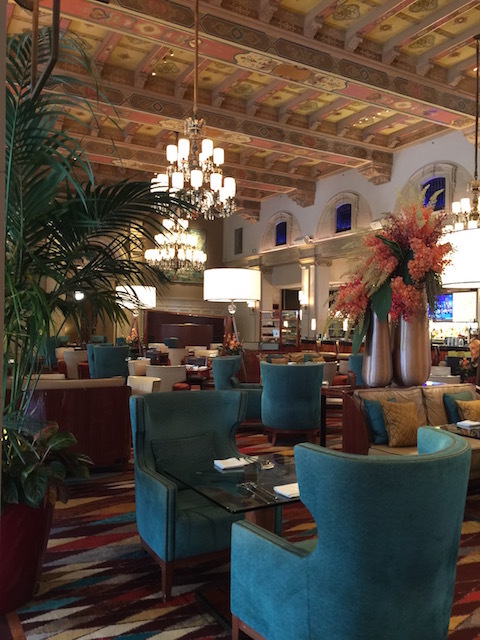 The Breakers is a grand old established hotel – the current building was constructed in 1926 and of course it has undergone several large renovations during it’s illustrious past. The scale of the public areas are enormous and you can’t help feeling some of the history pulsing through it’s walkways. Of course visiting it during September meant that we didn’t see it at the height of the season but we certainly got a taste of the place. The grounds are absolutely immaculate and tennis and golf are a huge part of the appeal for many people. I don’t think I’ve ever seen quite so many sporty folks bouncing and bounding around the lobby area ! The staff we were incredibly well trained and immaculately turned out. All the female staff get advice on their hair and appearance from the nearby Frederic Fekkai Hair Salon – I know because I went there to get a haircut myself – it was great by the way ! On Friday we met a friend who took us for a lovely long and leisurely lunch at a fairly new restaurant in West Palm Beach called Grato. We thought that we were not too hungry but managed to polish off a varied selection of dishes over a couple of hours…… particularly good were the wood fired artichokes with garlic aioli and also the pizza with buffalo chicken, caramelized onions and brussel sprouts …. 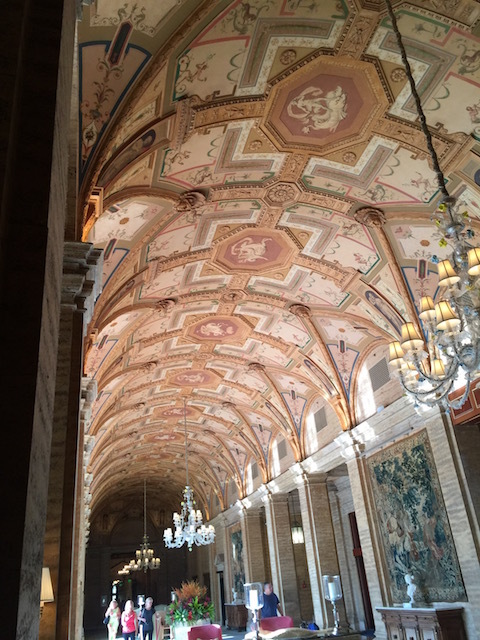 What a ceiling eh ! Later that night we ate a complete banquet at Echo – an Asian style restaurant that is part of The Breakers Hotel – even though it is off site. We had sushi, sashimi an incredible grilled lobster dish served on a lemongrass skewer – just divine – in fact we ate – between 3 of us – 10 savory dishes and 2 deserts – outrageous – but we didn’t actually polish everything off I’m proud to say. Many thanks to manager Chris and his brilliant team headed up by chef Joey – it was a real treat to meet everyone…..
No trip to Palm Beach is complete without a visit to Worth Avenue and we did have a cruise along it to check out all the high class stores – fortunately Fort Lauderdale was beckoning so off we went after not too much damage had been done ! In fact we had a quick visit to The Colonnade at Sawgrass Mills – it is a manageable part of the huge complex that makes up Sawgrass Mills and I do love to check out my favorite stores – absolute bargains of course. 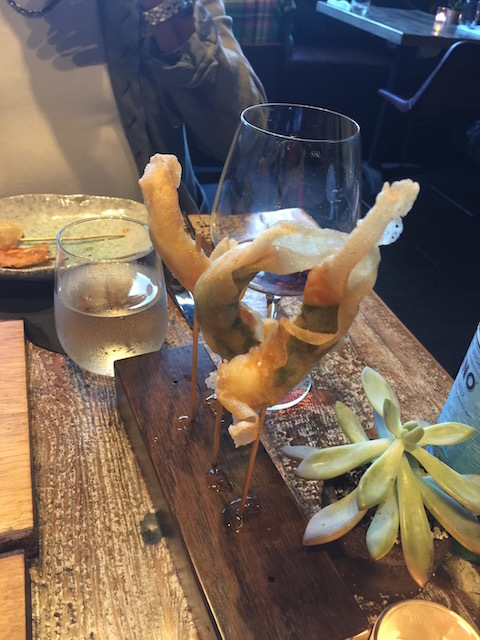 Picture doesn’t look too good but these crackling shrimp tasted so darned good ….. This is turning into a real blog about eating – as they often do when we take a trip – but I do have to tell you about a really spectacular new restaurant we went to on Saturday night in Ft Lauderdale. It is called One Door East and is right next door to our other favorite restaurant Valentino Cucina – in fact it is their sister restaurant. It serves in their own words – globally inspired tapas – and I highly recommend that you try it if you find yourself in Fort Lauderdale. 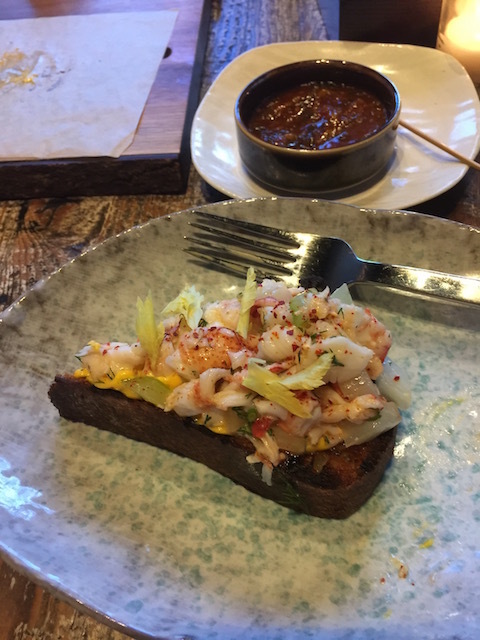 Especially good were the crackling shrimp, tuna poke, and lobster on toast – truly exciting and exceptional food….. Lobster on toast – over here please . Bob and our good friend and all round indispensable chap Tony Poletti ! 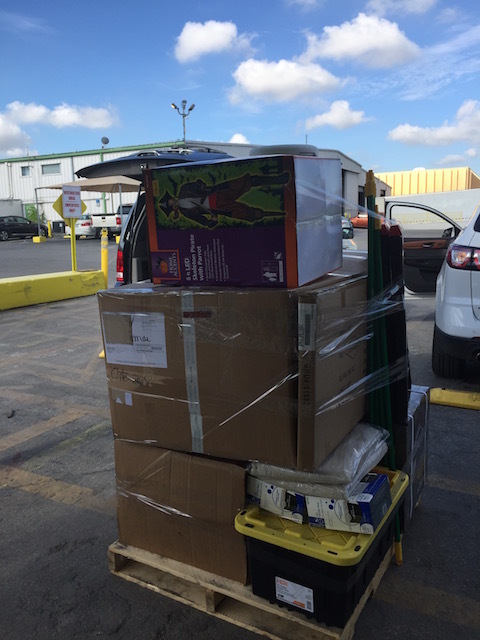 All packed up – and yes that is a 6 foot pirate skeleton for Halloween that you see – now you know why we have get off the island sometimes – a madness overtakes you that results in buying items like this ! Then we hit the ground running for another full on week -but not until we had picked up Rudge from our good friends on the Cay – thanks again to Dan and Larry for taking such good care of our boy – and incidentally giving him his first swimming lesson……..
Oh my goodness – what are they doing to me ? Do they think I’m a toy ????? Just drooling over everything! Perhaps it time to get off island for a wee bit. 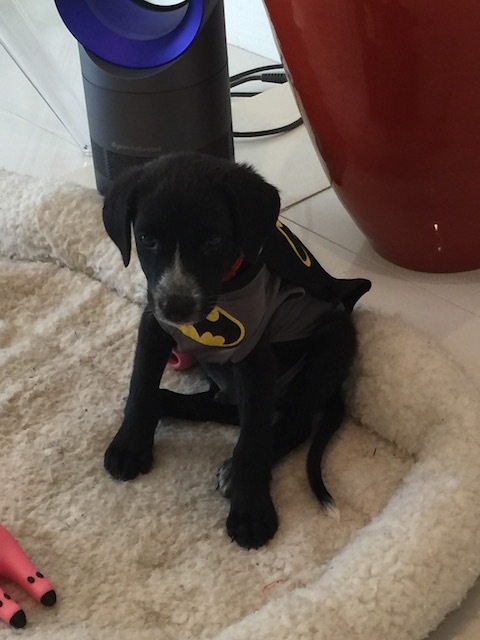 Batman costume is a winner! It was all delicious ! The costume was meant to be for Halloween – but I doubt it will fit him by then … The funny thing was he seemed quite happy rotting round in all dressed up – a tad worrying ! Riddle me this Batman.. Is Robin residing in Cupids Cay?